Videoconferencing technology is continually evolving and its most recent advancement, holographic telepresence, may be the next big thing. 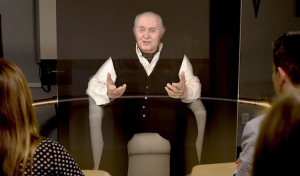 According to techtarget.com, holographic telepresence systems can project realistic, full-motion, real time 3D images of distant people and objects into a room, along with real time audio communication, with a level of realism rivaling physical presence. Here’s how it works. Images of remote people and surrounding objects are captured, compressed, transmitted over a broadband network, decompressed and finally projected using laser beams in much the same way as a conventional hologram is produced. This is a promising technology with the potential to revolutionize many diverse types of communications. In telemedicine, for example, telepresence can allow medical professionals to advise and assist colleagues thousands of miles away in real time. The technology can also reduce the necessity of travel for business meetings and facilitate distance education. Other potential applications include enhanced movies and television programming, advertising, 3D mapping, aerospace navigation and various other forms of simulation. Although it is still too early to predict the long-term acceptance of holographic telepresence, it does reflect the innovation that currently exists within the videoconferencing industry and provides a glimpse into the future of business communications. If you have questions about this or other videoconferencing solutions for your business, ask the experts at Trinity. Trinity Video Communications provides the most cutting-edge videoconferencing technology including software-based solutions and BYOD videoconferencing for commercial, healthcare, legal and law enforcement, education and government applications.